We are steam kettle experts. 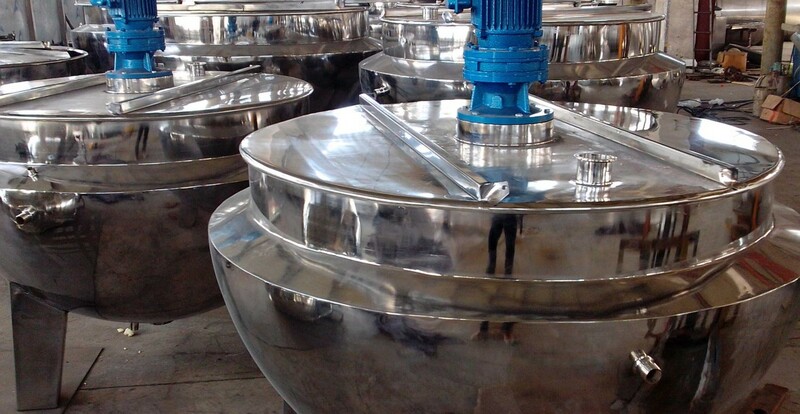 We have over 40 years of hands on, day to day experience working with steam jacketed kettles. We build, design, repair and install agitation systems, kettles, tanks and the related processing machinery. We offer superior value and unmatched skill. Get the agitator, repair service or modification you need at up to 50% off. Check out our selection of in stock kettles and agitation examples. If we don’t have the kettle you need we can get it for you. If you have or find a kettle without agitation send it to us and we will add the agitation you require. Something broken? Jacket leaking? Drive upgrades? We have a select inventory of high quality Kettles, Tanks, Pumps and other related sanitary processing machinery. Every item is sold completely reconditioned with a full warranty covering parts and labor. If we do not have it in stock we can locate it for you. With over 40 years of Sanitary Processing Machinery experience with a strong emphasis on steam jacketed kettles and their agitation systems. We are a fully custom fabrication shop dedicated to Kettles, Tanks and the related process machinery. We can help you with your machinery, parts and service. .
Give us a call, send us an email or text message. We listen to your requirements and help you determine the best possible way to accomplish your end result.